Maria Dennis flew into Kansas City Saturday for an unforgettable evening. It was a night she had been waiting two years for the moment she would finally meet the man who saved her life. Maria Dennis flew into Kansas City Saturday for an unforgettable evening. It was a night she had been waiting two years for – the moment she would finally meet the man who saved her life. "I wouldn't have made it. I absolutely needed a bone marrow transplant,” said Dennis. The wife and mother of two is a radio disc jockey in Baltimore. In March of 2014, she was diagnosed with Acute Lymphoblastic Leukemia (ALL), a rare form of Leukemia in adults. She needed an immediate bone-marrow transplant. "I had Leukemia in 90 percent of my bone marrow,” said Dennis. "I couldn't believe it. I have two children,” she said. Without a bone marrow match from a family member, Dennis spent several months at Johns Hopkins Hospital getting treatment. 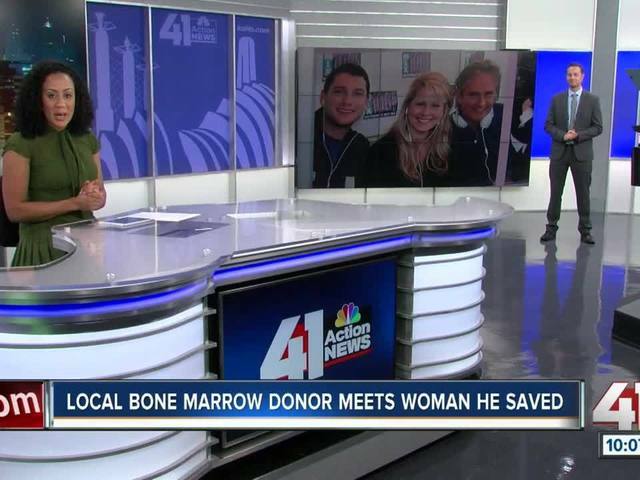 She was on the verge of death when she heard the news that doctors found a 100 percent match through the National Bone Marrow Registry. The match came from a man in Lenexa, Kansas. "You have the one cancer you can actually cure, right? Why not? It's not that difficult. It's actually easier than giving blood. It's a swab,” said Randy Braun. Braun volunteered to be a possible donor and was swabbed outside his church at a drive in 2012. When he got the call that he was a match, he didn’t hesitate to help. "Why wouldn't you do it? If you were given the opportunity to save somebody, would you do it?” he said. The successful transplant was made in June of 2014 after Braun flew to the east coast for the surgery. Dennis and Braun have been communicating through email for the past year. However, Saturday night was the first time the two met in person. "What do you say to someone who saved your life? Thanks? What do you give them a gift card?" said Dennis before the emotional meeting. "He's my angel. He saved my life,” she said. After the two embraced, Braun described what it was like to meet the woman he saved. "I saw a video of her and the first thing I thought of was my wife. It could have been my wife. They have kids who are the same age ... It's just quite a feeling, ya know? I feel very fortunate that I was even allowed to do something like this. I would think most people would do what I would do,” he said. "I'm on the radio and I can encourage and give light to people who don't necessarily think there's light at the end of the tunnel,” said Dennis. "Don't give up. Fight it until your last breath." While she will need to take medication for the rest of her life, Dennis is currently in full remission. The DJ has also helped her radio station raise millions of dollars for the Johns Hopkins Children’s Center, which also helps treat children with Leukemia.